I bookmarked a recipe for Artichoke Soup with Pesto several months ago. This weekend I looked at the recipe when I was making my shopping list for the week, and decided to give it a try. The recipe calls for pesto, and since I'm not a big fan of basil pesto, I decided to make some changes. One of my favorite appetizers to make is Spinach and Artichoke Dip (you have to try my recipe if you love this dip! 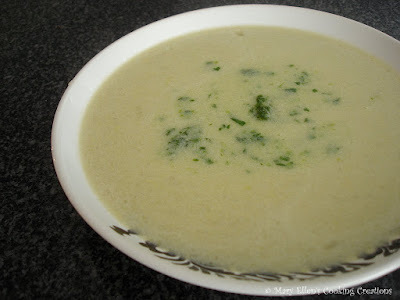 ), so why not do a spinach pesto with this soup? Below is my adaptation of the original recipe; the original can be found here on the Epicurious site. This soup is a very quick soup, and couldn't be easier. From prep to table, it took 25 minutes, including my time to make the pesto! Salt and white pepper, to taste. I used just a pinch of Kosher salt and 3 shakes of white pepper. Add artichokes and broth; bring to a boil and then reduce to a simmer. Let simmer about 5 minutes. Remove from heat and puree using a handheld immersion blender or transfer to a regular blender. Return to low heat, add cream, and season with salt and white pepper. 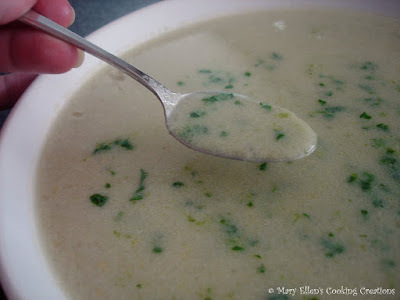 This is by far the easiest soup I ever made, and it tastes like spinach artichoke dip! a soup that tastes like spinach artichoke dip? I'm a fan! Finally, I find someone else who doesn't care for basil pesto! I'm now so excited about making this and since it's raining here again today, I'm going to make this tonight. I think I'll make those yummy looking pears for dessert too. Thank you for freeing me from basil pesto!